So I've decided to officially start my bridal bootcamp. (My friend tried to convince me to wait until after the Holidays, but then I'll be digging myself out of a hole.) 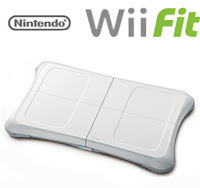 Since I don't have the time/money to spend on a gym membership, I'm working out at home with Wii Fit. For those of you who aren't familiar with Nintendo Wii, it is God's gift to...well, everyone. Its the perfect video game system for more serious gamers (like Dre), lightweight gamers who haven't really played much since childhood (like me), and non gamers who don't exactly know how the little box works its magic but they sure do have a great time (like my parents and grandparents).